Whenever someone says “estrogen” most people’s mind often wonders to dark places and often associate it with something bad. The truth is, estrogen is nothing bad, in fact, it’s the body’s magic potion that keeps a woman young and glowing! Here are common myths about estrogen and the truth behind then. Contrary to what people think, the estrogen in your body does NOT cause breast cancer. The truth is, estrogen is the one that helps the natural development of your breasts, and as long as you have those magical estrogen in your system, your breasts will maintain its natural firmness and perkiness. The natural estrogen produced by your body, and even the phytoestrogen, or the estrogen from plants could even protect you from developing breast cancer. Always remember that natural is always safe. 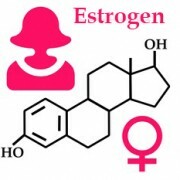 Synthetic estrogen or those that are made in laboratories could cause you more harm than good. Better stick with all natural estrogen in choosing what estrogen to take. You should also remember that there are instances in which taking estrogen is not safe. You should not take any form of estrogen when you are pregnant or breastfeeding. You should also not take estrogen if you are taking blood thinners. Estrogen makes your blood thick and promote blood clotting, so if you are prescribed blood thinners it might be counter-productive. Truth: Estrogen helps increase your metabolism. The estrogen in the body aids in the metabolism of carbohydrates in the body, to give you an attractive waistline. This is especially helpful for women who are trying to lose weight and have an exercise program. Remember that estrogen only helps you lose weight, you still need to have a healthy diet and a regular exercise routine to get the figure that you want. A lot of women are afraid to take estrogen, in fear that it might make them stupid or forgetful, well, that’s not true. Estrogen preserves and enhances your verbal memory. During menopause or when you need more estrogen in your body, you might notice that you are starting to get a little bit forgetful. Neurologists have found out that this is linked to the lack of estrogen in the system. So, there you go ladies, estrogen makes you smarter and NOT dumber. Oftentimes, people link estrogen with women and testosterone for men. That is true, but it does not mean that women only has estrogen in their system and men only need to have testosterone. Small amounts of testosterone are converted into estrogen. It helps with modulating libido, erectile function and in production of sperm. Normally, during a woman’s peak years, there are abundant estrogen in the body, but overtime, the body slowly decreases its production and eventually stop producing it. Without estrogen in the body, there will be vaginal loosening, a decrease in libido, vaginal dryness, sagging of the breasts and other menopause like symptoms.